Beginning November 2, movie audiences nationwide can play along with Disney's Wreck-It Ralph in a new big screen interactive augmented reality (AR) game from Noovie ARcade, the revolutionary companion app for the Noovie pre-show. The new Ralph Breaks the Internet game - the first studio collaboration for Noovie ARcade - is an exciting part of the marketing campaign for Ralph Breaks the Internet: Wreck-It Ralph 2, which hits theaters nationwide on November 21. With the Ralph Breaks the Internet game from Noovie ARcade, moviegoers can enter the virtual Pancake Milkshake Café through the Noovie ARcade app and tap the buttons to feed the Kitty and Bunny as fast as they can, just like in the official teaser trailer for Ralph Breaks the Internet. But remember, the Bunny gets the pancakes and the Kitty gets the milkshakes! Noovie ARcade is available free in the iTunes and Google Play stores from National CineMedia (NCM), America's Movie Network. To play, audiences should download the app and arrive at least 20 minutes early to their local Noovie theater to catch the Noovie pre-show, which will prompt viewers to open the app and aim their phones at the big screen when it's time to play. Then, through their mobile phone, the movie theater will transform into a larger-than-life game setting! The first app of its kind, Noovie ARcade gives movie fans the chance to enjoy a gaming experience like no other while waiting for their feature film to start on over 21,100 movie screens in over 1,700 top theaters nationwide, including AMC, Cinemark, Regal Entertainment Group, and 50 other regional and local exhibitors. 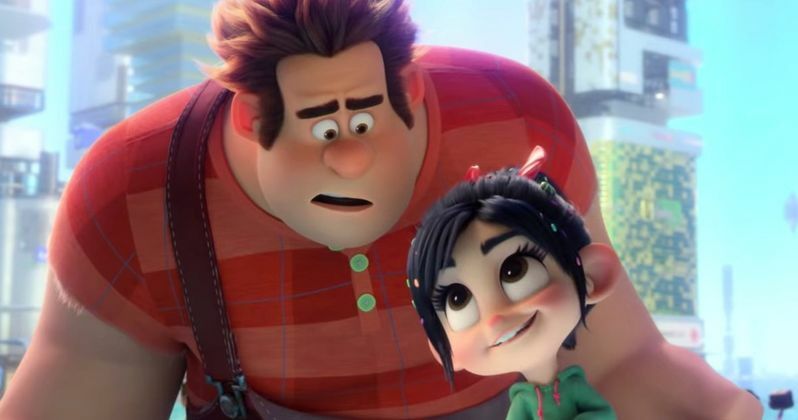 In the highly anticipated follow-up to Walt Disney Animation Studios' Wreck-It Ralph, video game bad guy Ralph (voice of John C. Reilly) and fellow misfit Vanellope von Schweetz (voice of Sarah Silverman) navigate the vast and dynamic world wide web in search of a replacement part to save Vanellope's game, Sugar Rush. Said David Sieden, Vice President, Cinema Partnerships at The Walt Disney Studios. "Disney Animation has always embraced new technology to bring our characters to life on the big screen, and we're proud to work with NCM and Noovie ARcade to be the first studio ever to deliver an in-theater augmented reality gaming experience for movie audiences. Movie theaters are the perfect place for people to come together and enjoy the magic of Disney movies, and augmented reality gives us a way to make that magic jump off the screen and into the hands of audiences through their phones. It's the perfect way to get moviegoers excited about Ralph and Vanellope's crazy new adventure in Ralph Breaks the Internet." The Walt Disney Studios is also the premiere studio collaborator for NCM's Noovie Backlot content segments, offering movie audiences a unique behind-the-scenes looks at upcoming films from Disney, Pixar, Marvel Studios and Lucasfilm. Said NCM Chief Digital Officer, Rick Butler. "Disney has been our premiere Noovie studio from the beginning, and we're thrilled to work with them to break new ground in augmented reality gaming. The unique environment of the movie theater is perfect for a shared AR experience, and this is just the beginning of the fun new movie-related games that audiences can expect at their local Noovie theater." In Ralph Breaks the Internet, video-game bad guy Ralph (voice of John C. Reilly) and best friend Vanellope von Schweetz (voice of Sarah Silverman) leave the comforts of Litwak's arcade in an attempt to save her game, Sugar Rush. Their quest takes them to the vast, uncharted world of the internet where they rely on the citizens of the internet-the Netizens-to help navigate their way. Lending a virtual hand are Yesss (voice of Taraji P. Henson), the head algorithm and the heart and soul of the trend-making site "BuzzzTube," and Shank (voice of Gal Gadot), a tough-as-nails driver from a gritty online auto-racing game called Slaughter Race, a place Vanellope wholeheartedly embraces-so much so that Ralph worries he may lose the only friend he's ever had. Directed by Rich Moore (Zootopia, Wreck-It Ralph) and Phil Johnston (co-writer Wreck-It Ralph, Zootopia, writer, Cedar Rapids), and produced by Clark Spencer (Zootopia, Wreck-It Ralph, Bolt, Lilo & Stitch), Ralph Breaks the Internet hits theaters on Nov. 21, 2018.